"...The Harrison County commissioners, Conotton Creek Trail Committee and the Adventure Cycling Association will be cooperating with ODOT and other stakeholders to designate specific routes in the county to become U.S. and state bicycle routes. From timesreporter.com, "SCIO Harrison County commissioners have received a grant of up to $950,000 to repave the entire 11.2 miles of the popular Conotton Creek Trail. "...The money will be available in fiscal year 2021, which begins in July 2020." From wtov9.com, "Those who use the Conotton Creek Trail in Harrison County will be seeing upgrades to the path, made possible by a pair of nearly $10,000 donations from oil and gas companies. "...The committee is planning on using some of the money to purchase a generator and paint sprayer to seal the numerous covered bridges that are peppered along the trail. It is also planning to build a winterized bathroom for trail goers in the near future." Facilities: Some portable toilets should be available along the trail. Worth Noting: There may not be any water sources on the trail. Expect to venture into one of the 3 small towns along the trail for hydration. Stunning views may not abound here, but rural peacefulness is the order of the day, according to many visitors of the trail. The trail is a source of great pride in Harrison County. 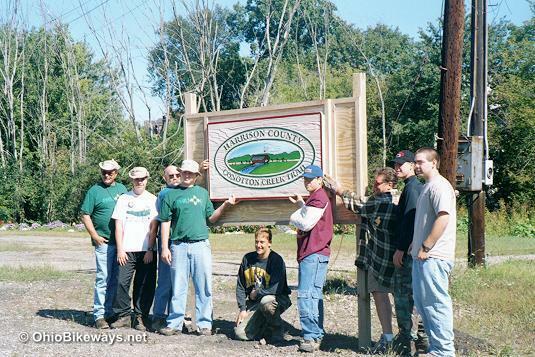 Locals volunteer their time and effort to not only maintain the trail, but to construct the 5 covered bridges along the 11-mile trail route. The trail surface is unique in a couple of respects. The surface is mostly flat, like many rail-trails. Though I do recall one or two very slight undulations that were a welcome break from the monotony. Also, the trail has a history of having a coarse asphalt surface. Originally topped off with a thin layer of gravel, the solid yet coarse surface was not conducive to roller blading or thin-tired bikes. However, larger tires do a fine job of smoothing out the ride. 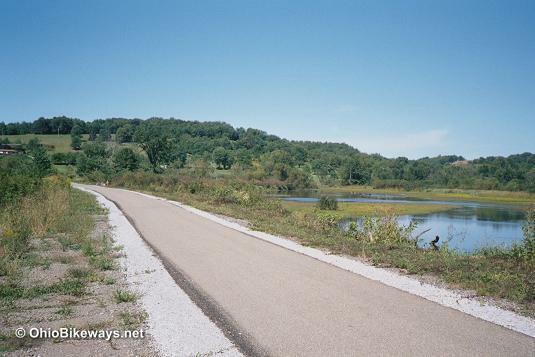 In 2018, funding has been received that will allow the entire trail to be repaved. However, the money will not be available until fiscal year 2021, which begins in July 2020. In the meantime, take your hybrid, cruiser or mountain bike to ride this trail. It will help make your ride a smooth one.